Radiator Repair, Radiator Shop, Tucson, Arizona | Accurate Service Inc. Yes! We can fix your vehicle’s radiator! Family owned since 1996, Accurate Service provides complete automotive radiator repair for cars, pickups, SUV’s and commercial trucks in Tucson, Arizona. Accurate Service has been providing Tucson with honest auto repair for over 21 years. The radiator is a part of your vehicle’s engine cooling system and is responsible for preventing the engine from overheating. When in use, the engine puts off a lot of heat and friction. The radiator, with the help of coolant, helps to make sure the engine runs at a temperature that is healthy for the vehicle. Low coolant level. If your vehicle fails to maintain a certain amount of coolant, the engine will overheat. Coolant levels should be checked at every oil change to avoid having them get low. A sweet smell, much like that of syrup, coming from the vehicle could indicate a coolant leak. Radiator leak. Finding the source of a radiator leak can be more difficult than a leaking hose. If you see steam or bubbles coming from a certain part of the radiator, that may be the location of the leak. Radiator leaks are tricky repairs that should be handled by trained professionals. Broken radiator fan. There is an electric fan in most modern vehicles that pulls air through the radiator to help keep the car cool when it is running at low and idle speeds. If your car is performing well driving on the freeway but overheats in traffic or when idling, it could indicate that your radiator fan is broken and in need of replacement. Broken water pump. The water pump moves the coolant throughout the engine to regulate the engine temperature. When it fails, the water will not circulate properly and the engine will overheat. This is a very common problem. Failed thermostat. The thermostat is not technically part of the radiator, but it is often the culprit behind an overheating engine. The thermostat is a valve that controls the amount of coolant that flows in or out of the radiator to keep the engine running at its optimum temperature. When a thermostat fails, the engine will overheat rather quickly. 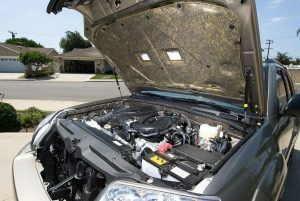 Our expert auto technicians offer the best car radiator service and repair in Tucson, AZ at the best prices. We service all makes and models of vehicles and can do any repair whether it be large or small. Skip the dealership and get quality auto repair service- with attention to detail -from Accurate Service, the team you can trust.